I've done a few posts on vegetarianism. But I've been thinking about it a lot lately because I slipped. My laziness plus entitlement lead to some convenient thinking. I'm recommitting today. I read Bodhi's book, and it's convincing. I think I need to look at some horrifying videos to drill the point home to me. Check out PETA's web site. I finished reading Ayya Khema's autobiography I Give You My Life. Here's some reviews and summaries. She led a pretty interesting life, from fleeing Nazi Germany, to living in Glasgow and Singapore. She got married and moved to San Diego. She got divorced and met another man and traveled all over the world. It is only about half way through the book that she discovers Buddhism. The second half doesn't really resemble a spiritual memoir. It's more like summaries and bullets. She writes like a journalist, and there's very little reflection. She doesn't debunk the German stereo type. She's a sort of Buddhist Albert Ellis, at times. She has done some good things organizationally and she's obviously a charismatic person to be able to give so many talks, teach so many people. She falls within the Theravadan tradition. While I won't recommend the book as an autobiography or as a spiritual memoir, I did find it an easy and agreeable read. For those who are interested in the history of Western Buddhism and famous Buddhist women's experience, it helps to flesh out the story of Buddhism in the West. I've read Being Nobody, Going Nowhere, which I recommend as solid dharma, and I've ordered another book. Supposedly she has over 25 books which are edited from her talks, like so many Buddhists. Jayarava has an interesting essay suggesting in conclusion, "I'm not very enthusiastic about the possibilities of virtual communities or even virtual sanghas as a substitute for the real thing. There is no substitute for personal contact. I would argue that virtual community is not like community for practical purposes: "virtual community" is an oxymoron. There's nothing like the real thing..."
Creativity is valued in the FWBO, so it's interesting to get an outside view of creativity. Read this article by Mihaly Csikszentmihalyi from Psychology Today in 1996. All credit due, I found this at Integral Options Cafe. 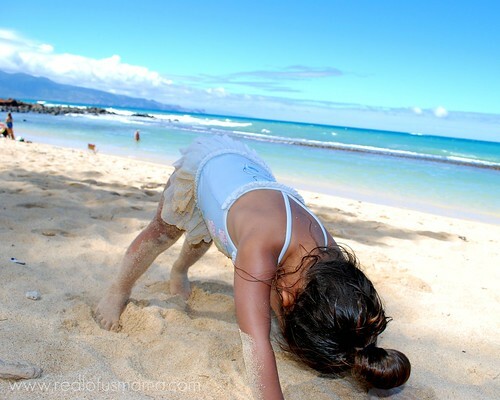 Check out this link, that asserts concentration is not mindfulness. One pointed is an aspect of mindfulness, and concentration is it's near cousin, so is absorption, but for me mindfulness has a quality of kind, non-judgemental observation, that leads to continuity of purpose and skillful behavior and speech, among other things. I don't know who this Theravadan teacher Ajahn Sumedho is, but he's got a book. There's truly an ocean of Dharma. Do I need more? I need to put in place what I already have. Here's an article at Ecobuddhism about how to save fuel, from a blog which seems promising. Living in NYC is perhaps one of the best things you can do for the environment. More public transportation, housing doesn't leak heat because many live in buildings, and we don't spread out, destroying untouched land. Ironically, the best thing you can do for nature is to get out of it. I find that many people who "love" nature, love it to death by being in it. My "nature loving relatives" buy land and build a house where there was none before. Drive long distances for groceries. I guess I wonder if we have the foresight to head off the disaster. Does that mean I'm hopeless, and don't have faith in myself and the human race? Pessimistic people are more often right, but they also don't lead as good as lives as optimist. So while in assessing and predicting, I think pretty dire. But I do hope that we can be more intelligent and more far sighted, with leaders who can think more about the future than getting re-elected. We do the best we can. We are puny, have little impact in this world, but there are some people that have a big impact, and who knows, maybe that's you (or me). We are interconnected, so we do have power to change things. I don't think the battle is just inside us either, we need to take the battle outside ourselves and be engaged with the larger world. I recognize that that's not easy for me and be realistic. I want to be as kind to you as I am kind to myself. Attaching myself doesn't help, and I can easily use my carbon imprint to attack myself, my lack of control over myself. I can extrapolate that to others, their lack of control. I think we all have a little Eliot Spitzer in us all. While fighting corruption, he himself is corrupt. That doesn't mean he didn't do some good, and it's good to fight corruption in government. I think the poverty of the 3rd world makes corruption inevitable, and makes it so hard to help out there. So I try to be the change I look for in the world, and try to lead others along with me, try to give my children a sense of the importance of the larger systems of the earth, give them a larger view of things. I am empathetic to ecological causes, but I'm also realistic about myself and others. I have all the parts of what everyone else has, so I think about the larger picture and I am selfish and destroy our world. There is inevitable destruction, but we could be a little more judicious and think about the issue. My plea is to think about the issues and live more consciously. It will send us on a road to saving the planet, but we need to go further, and I'm trying, we're trying. I see it, so keep up the good work, and reach for more. I wonder if blogging takes me away from more essential things, like relating face to face, meditation, exercise, being outside, cooking, cleaning, paying attention to my kids (not right now, they're at school). If I blog in spare moments, I'm not avoiding those things, I feel like I have the space. In those tiny spaces, I could rest, and not be so active, think. It does help me to process what I'm learning and express myself. But I wonder if my energy could be better spent elsewhere. That's really an issue of time management and priorities. 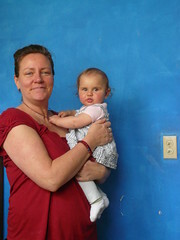 I admire The Conscious Mom, who is closing down her blog. She's also signed off Facebook as well. The link will be dead, so you can look at it for the time being. I will miss seeing pictures of Maia, and having a kind of tangentle relationships with acquaintances and friends from far away. I do think long distance computer surveillance does have it's uses, and there's an article from the times that suggests that. So while I admire what she's doing, I'm not ready to do it yet myself. I hope some day to get there. Gives me something to think about. You can always go to Wildmind to see the latest in meditation news, but I'll pass on ones I read. I don't personally need any more validation for the fact that meditation is good, an amazing life changing activity, life enriching. I love talking meditation with others who meditate. Anywho, here's an article about why meditation is good. Anne Harrington, a Harvard University history of science professor, says, "Long-term meditation rewires the brain and can make a person happier and maybe even healthier,"
Harrington said, "In a 1969 study conducted by Robert Keith Wallace, monks who had been meditating for 20 or 30 years showed levels of attentiveness that were 30 times higher than those of controls." While she doesn't actually mention psychotherapist, Andrea Miller discusses how mainstream being mindful has become. I think this is a simple but very hard to put in place idea, and is at the heart of mindfulness. You learn radical acceptance in meditation if you are there, because things arise and you just watch them, watch how you try to get them away, and watch how they pass away of their own accord. I love this idea, I need to watch this video every morning to let it's lessons sink in. Sangharakshita has said that most people have enough Dharma and information to head towards enlightenment. It's the really knowing it and acting on it, and incorperating it. Danny has a list of Buddhist blogs. What's the point of reading a bunch of Buddhist blogs? Hasn't Emmerson already told us the virtue of self reliance? That what and how we feel is really enough, we don't need to be validated by others, we don't need others to think for us. On the one hand, we have to do it ourselves, nobody else can help move us closer to the Buddha. On the other hand, we're all interconnected, and the arising of the Bodhicitta is in the context of others. We need others to care about, to overwhelm us. It's another part of the dialectic of being a Buddhist, which includes withdrawal vs. engagement, self vs. other, indulgence vs. control, and so many more polar opposites. Also beware the premature synthesis. Not on my cable, but here's a review with a video of a show from the NY Times. My feeling about Tibet is--when are the Chinese going to get out?! Reading the article, I can't imagine that somewhere someone in China doesn't have a twang of guilt and regret. Are they so entitled that they can just take countries? The silver lining is that I think the Dali Lama shows us how to react gracefully to this, without resorting to violence. Perhaps they can have another velvet revolution. It's a nice graphical text representation about how meditation works in the FWBO. It may only be interesting to people in the FWBO. But I find it fascinating. Exploring the refuge tree of the FWBO, we come across Dilgo Khyentse. He has a lovely website that includes some written teachings. I love his book The Hundred Verses of Advice. The FWBO refuge tree is explained in this essay by Kulananda. 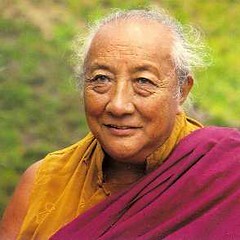 Here's a search on YouTube with his name, Dilgo Khyentse Rinpoche, that includes many videos. I'm not sure if it's legal, but here's a video of the movie by Matthieu Ricard called The Spirit of Tibet. He died in 1991 according to the video which is shown in 5 parts here. I watched the videos and there's lots of good footage of him, and gives some background to his importance. Sangharakshita has a talk about him. The Sutra of The Great Vows of Ksitigarbha Bodhisattva can be found on the Wikipedia entry by clicking on the hypertext. You can find others by googling it. The mantra for Ksitibarbha is "om ksitigarbha bodhisattva yah", according to Teachers of Enlightenment. I'm not sure when I'll get around to reading that, honestly. I "discovered" Ksitigarbha on retreat a few months ago. I'm just following up my interest when I was reading Teachers of Enlightenment about Milarepa and checked out the entry on Ksitigarbha, which led to Meeting The Buddhas and checking out the Ksitigarbha entry there. Meeting The Buddhas is an amazing book, about all the Bodhisattvas, the mythical personifications of the qualities of enlightenment. Teachers of Enlightenment is about the FWBO refuge tree, the people on it. I'm reading 100,000 Songs of Milarepa right now. I'm on the amazing chapter 28 and 29, which are a real highlight for me. At times the songs can seem boastful or lists of lists, but others phrases will catch me and I will feels the greatness of his songs. If you don't know anything about Milarepa, drop everything and read about him. He's got a cool life story and he's amazing. He should be part of any basic human cultural awareness, whether you're a Buddhist or not. Here is a version of his life story with pictures. It's a huge book and I pick it up and put it down. I've been dragging my feet to write a review of The Yogi's Joy. I just feel overwhelmed by the greatness of the book. So I thought I would read through all of the songs just to give me the confidence to read the book a 3rd time, and really attempt a review. I didn't get up there for the artwork done by Tibettans, but here's a link to some photos on the web, a Buddhist mother's blog that I follow. Here's a link to the guy who wrote Seven Years In Tibet, and his photos from them. Danny has come up with another interesting list of Buddhist fiction. I have to say I've only read 4 of the books mentioned here--I'm aghast. Lost of books to order! Thank you Danny. The incomparable blogger Danny Fisher has blogged a list of Buddhist of memoirs that is useful. I added Precious Teachers by Sangharakshita. The Dhammapada is a book of saying from the Pali Cannon. The Pali Cannon is what the monks could remember of what they memorized from what the Buddha said, written down hundreds of years later. The Dhammapada was the first book from the Pali Cannon that I was introduced to. It makes excellent reading for a father at the park with his children, because I can read a few sentences, walk away and return. Of course more concentrated reading of it is advised, but of all the Pali Cannon, I find it the best for going to the park. I took a picture of my copy against the playground. There are over 50 translations listed on the Wikipedia entry about the Dhammapada, but they don't list the free one by Sangharakshita that can be gotten here. It is a PDF file. My reading style, because I'm a parent and character style, isn't as concentrated. When Sangharakshita wrote A Survey of Buddhism, his famous magnum opus, he talked about looking at the breadth and depth of Buddhism. I'm afraid I'm not as deep and insightful, but I am more able to follow the breadth of study. I like to read a lot. I am working to read more deeply and closely, to linger and not be so fickle in my reading. But reading (potentially, possibly) the words of the Buddha (in translation) is for me a way of keeping my eye on the Dharma. I am a worldling, and worldings forget, they get wrapped up in the world, forget the dharma. The Dhammapada addresses the motivation and concentration one needs to keep the continuity of purpose to work towards closing the distance between the Buddha and me, which is my goal. As I finish off the book today, I know it will come back in my rotation soon, because it's pithy sayings fit nicely into my spending time at the park with my kids. I hope I can linger more, work to grok the sayings. Some feel more true than others, some energize me more. So I'll use those, but I'll also strive to glean more out of the ones I don't really cotton to, yet. There are 423 sayings in Sangharakshita's translation to choose from. It's been said if you really understand even just one of these sayings, you can become enlightened. So I shall strive for greater depth. This is also in line with the idea that I probably have been exposed to enough Dharma to be enlightened, I just need to really understand it. "More and more of less and less," is one of the mottoes of the FWBO. We live in an age of probably over 60 English translations of the Dhammapada. I only need one. Having said that, study is an important part of my practice. Not so much what I learn, but in the deepening of my understanding of the way things really are. The process of grappling with what past and present masters have written is a way of keeping my head in the game, as they say. I like it that the FWBO is ecumenical, meaning inclusive and nondenominational. I can read all the Buddhist literature, and don't define a small subset as the true Dharma. And yet I do like to go back to the Pali Cannon. And I do go back to Sangharakshita's teachings as a touchstone. I choose his translation over others. I have not had much time to explore other movements, as much as I am interested in reading leaders books. I have spent my Buddhist life inside the FWBO, and while it's not perfect, I had a feeling the other day that I have such strong, long and deep connections with friends in the FWBO, that I'm not really looking for another sangha. Vessantara and Kamalashila have talks on Free Buddhist Audio about the dangers and virtues of exploring other teachers and sanghas. Kamalashila suggests investing 10 years at least in one sangha in his talk. Vessantara has always consulted with Sangharakshita, and been given permission to explore other teachers, he reports in this talk. I think feeling the tension of opposite ideas is a key that you're onto something. Depth vs. breadth, fidelity vs. promiscuity, engagement vs. withdrawal, self vs. others. Sangharakshita warns against premature synthesis. I hope to highlight verses from the Dhammapada that I liked, in the future, but I wanted to write a general bit first about the Dhammapada. I went on a solitary retreat last February. It was lovely. Here's a video of Suvarnaprabha while she was on a solitary retreat, speaking to the video camera spontaneously. I found some maps of Buddhism in the world at Wikipedia. Basically it's in the east. It's not completely updated, but interesting graphic representation none the less. A friend took some photos of the place. Judaism is a beautiful religion. I've read The Gift of the Jews. My step-father is Jewish, and I went to some Seders. I went to camp Shalom one summer and learned how to sing Hava Nagila. I worked for 12 years at a school that had holidays for the Jewish calender, and another agency that was owned by someone who was Jewish. An uncle also is Jewish. I live in New York City which Jesse Jackson famously called Heimie-Town. I even live on the edge of a more orthodox neighborhood, where ironically my step-father grew up (considering we met in Madison Wisconsin, and more importantly my mother met). I have some Jewish friends who I don't see enough of. Which is a long winded way of saying why I like this link, that Sarah Jessica Parker is the latest Jew-Bu. Here's a quote from the article: "What’s a Jew-Bu? ‘It’s a synthesis of Judaism and Buddhism intended to grasp the best of both religions,’ explains one Hollywood power-player who has been a Jew-Bu for the past decade. ‘It combines Buddhist thought with Jewish theology and structure, in effect incorporating Buddhist traditions such as meditation and chanting into traditional Judaism.’"
And here's a quote about famous Jew-Bu's: "Famous entertainment industry Jew-Bu’s include Leonard Cohen, Goldie Hawn, Kate Hudson, Jerry Seinfeld, Gwynneth Paltrow, Larry David, Jeff Goldblum, Al Franken and Whoopie Goldberg, among others." Another interesting quote: "Chogyan Trungpa, to talk about forming the Oy Vey school of Meditation." Here's another post on the JuBu phenomenon. In the article it says in the FWBO Kulamitra is of Jewish origins. My first link to a Korean site. 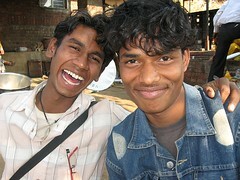 Lokamitra won a prize for his work with the ex-untouchables in India. Here's a link to a Korean video about it. Here's a Vapassana talks site. "In some ways, it feels as if incorporating children (and other human realities) into Buddhist practice is the last frontier for most practice centers, modeled as they are on a rarified, monastery-inspired retreat model (which, incidentally, is a specialized activity even in Buddhist countries)." Following link, I found a Dharma games site. I haven't seen it yet, but I will watch this about 45 minute video, on the history of the FWBO. Someone made a video of the retreat. Interesting article on Buddhism in Japan. We went to a cool restaurant in SF. Another great thing about the retreat was to see ex-Dino become DanaKamala. So I asked for ordination into the Wester Buddhist Order several years ago, and they have retreats for the men about once a year. This year the retreat was held at Jikoji. It was lead by Dhammarati, who did a wonderful job. We studied the eight point mind training. One revelation on the retreat was to find out more about Ksitigarbha. The retreat was on bodhicitta, and I learned a new meditation to facilitate that. Because my last retreat was solitary, I found it was easier to take refuge in the sangha. The word vipaka was used a lot. It's the fruit of karma. Also, I was mortified to find out I was the only one who didn't know what Quinoa was. Turns out it's nutritional content is good, it is a more complete protein. Bookending the trip was a visit to my father and stepmother in Livermore. Tomorrow I fly home and I look forward to being reunited with my wife and children. In searching trichiliocosm, I found Rigpa Wiki, which is, "an online encyclopedia and media library of Tibetan Buddhist teachings designed especially for students of Rigpa and Sogyal Rinpoche." I'm reading Conze's The Perfection of Widson in Eight Thousand Lines, which came out in 1958. I bought the book, but you can find a PDF file of it here. But when there arises to him the mindful thought, ‘That is nothing difficult. I'm visiting my father and step-mother before the retreat. They are kind and good hosts. Meditating is OK with them, they give me space to prepare for my retreat. I'm adjusting to the time zone, recovering from the flight. I'm excited to begin tomorrow. I'm enjoying a memior called Turtle Feet, about a guys time as a monk in Dharmasala. It's Jack Kerouac without the booze, more intelligent and really spiritual, but with the intense over the top friend, and the odd assortment of characters. My ride will be outside in 5 minutes. I'm sad to leave my family. I'm tired from all my responsibilities. I'm excited to go on a trip, to see the guys, to be on retreat. I felt the mindfulness increasing as a kind of anticipation of retreat. Six years isn't a long time, but I have done retreats every year and in the early years I did a lot of retreats before the kids came along. I was talking at work about how it's hard to lift up the responsibilities when I return from retreat. Time passes, I know, and soon enough I will be back. To be mindful through it all is my goal, and to spend time with friends. One pointed and in the moment, flexible and kind. Open and willing. Wish me luck! Batchelor writes in Living With The Devil, "The practice of waiting is to learn how to rest in the nirvanic ease of contingent things. yet waiting is not passive inaction any more than emptiness is nothingness. As an alert stillness that cradles perplexity, it is the ground from which we can respond in unpredictable ways to life's unfolding and the inevitable encounter with others." p 117. It's been suggested that my path is that of the perfection of patience, so I thought this was interesting. My friend intimated something similar, surprisingly. Stephen Batchelor's book, Living With the Devil, is really good. He's talking about the metaphor of the path, and notes that in other languages you can say "pathing" as a verb. He write, "The art of creating a path is to do neither too much nor too little." There are many great quotes about path. Tomorrow I go on a sangha hike with Alyssa and Maria, so the term path is even more poignant. I might xerox some pages to read while we're on the hike. We were lucky enough for Batchelor to agree to meet with the NYC FWBO sangha, when he was in town promoting the book, and he was generous enough to give our sangha a copy of the book. I never got my hands on it, even though I was generous enough to share it when he handed it to me. I broke down and bought a copy for myself. He's one of my favorite Buddhist authors. I highly recommend his books, and especially this one. Also of note, there are some good talks of his on the Upaya web site, in the podcasts. He also share some talks on his site.